Brand: CK Products 42-800 Units: 1/2 fl. oz. jar Add tartness to your candies with citric acid. To use citric acid in hard candy, allow cooked candy mixture to cool to below 265 degrees F (to keep flavor from cooking out). Use 1/8 tsp. for every 2 cups of sugar used in recipe. 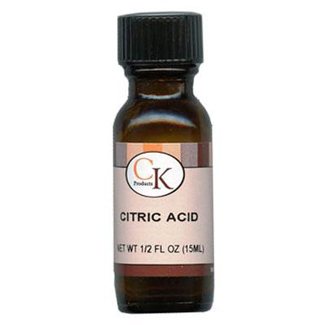 Add tartness to your candies with citric acid. To use citric acid in hard candy, allow cooked candy mixture to cool to below 265 degrees F (to keep flavor from cooking out). Use 1/8 tsp. for every 2 cups of sugar used in recipe.